I traveled to St. Paul a few weekends back to take part in the St. Paul Craftstravaganza. Although the weather wasn’t the best (it was snowing and freezing, yuck! ), I still managed to have a good time. Some of my favorite items included felt pins from Pink Sparrow, Wellie shirts from Charlie and Sarah and letterpress mix CD sleeves from Zeichen Press (of which I bought several). Also, I must say “Hello” to fuzFrenzy and Wild Oats who (sitting on either side of me) helped make the cold, which my sister is smiling through in the photo below, better. The day after the fair, we set out for some of the DIY-centric businesses in Minneapolis. We stopped first to check out I Like You. Owners Sarah and Angela (pictured at left) have turned this handmade gift shop into a must-see, stocking favorites like ERKA and Too Many Suitors. I especially enjoyed the library card catalog turned card rack and the suitcase full of cute shrinky dink zipper pulls (of which we also bought several). Next we checked out Design Collective, an indie fashion boutique focusing on local designers that definitely reminded me of the much-missed Pure Design Lab. I spent a little too long lingering over Marisa Grey’s Anouk line admiring the adorable tailored, girlie pieces. 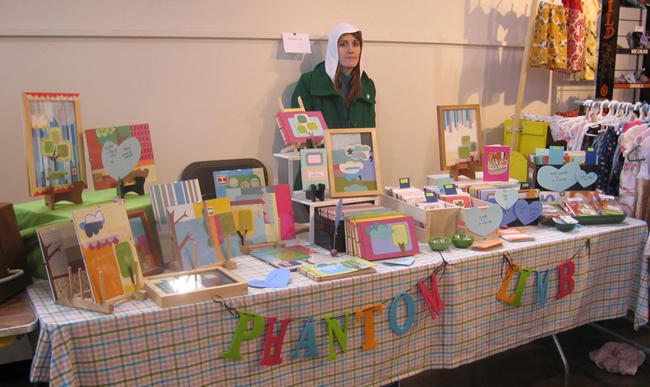 And finally, just before they closed for the day, we hit up Crafty Planet. I wasn’t suppose to spend any money there, but once I saw the new, bigger store (they just recently moved) who could resist? The fabric in particular is much easier to see and covet and I ended up with 4 different kinds, including this adorable Wizard of Oz print. Detroit definitely needs a shop like this — Trish, if you ever want to franchise, I would be happy to run a Detroit arm! View some full size photos of my trip here. Ooh, crafty vacation! Poor Pam, she looks frozen in that photo!